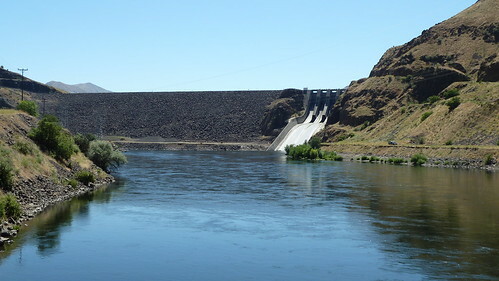 Looking at the maps for the next section of the ride through Idaho, one thing was plain to see, rivers where going to be a key part of the scenery, with much of the route following the Lochsa, Middle Fork Clearwater, Salmon, Weiser, Snake and Powder rivers. It was also the last time zone change on this journey and being the Pacific Time Zone it almost felt like it was all down hill from here! After 3 nights in a comfy bed in Missoula, I was feeling well rested and keen to attack the mornings challenge of the Lolo Pass (5235’). An early start on a Sunday meant quiet roads and the 47mile ride to the summit was scenic and enjoyable. On reaching the top I pulled in at the rest area and Information Centre and got chatting with a few cyclists. Not long after, Klaas and Gosse the Dutch guys who I had been introduced to at the ACA office appeared, we sat at a picnic table and had lunch and arranged to meet later at Powell Camp Ground over the pass. 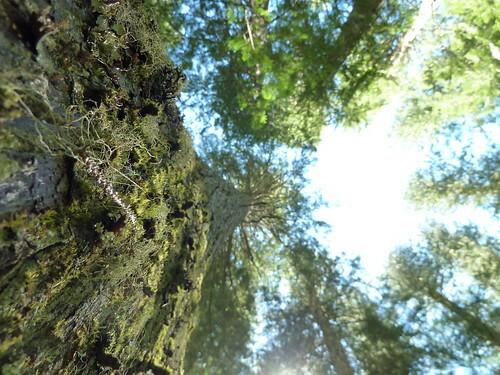 I stopped part way down the pass to wander round an area of huge majestic Cedar trees nestled in amongst the Pines. I was soon at Powell Camp, a basic Forestry Service site with no showers, but with me, the Dutch guys and another cyclist called Charlie all easily fitting onto a pitch, it was a cheap night. 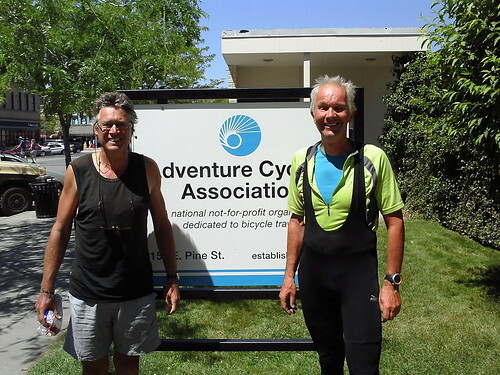 Klaas a GP and Gosse a linguistics lecturer were experienced cycle tourists, having covered much of Europe on their bikes, often cycling from the Netherlands to the south of France to meet up with their wives and children for summer holidays. Their “Giant” bikes being set up in a very sit up style and sporting the popular butterfly bars, seen on the bikes of many main land European cyclists I met. They also had a magical pannier, that every night would produce an array of cooking equipment and bags of ingredients that Gosse would use to conjure up a stunning meal. Luckily they had invited me for dinner that evening so I went over to my tent to get ready. Perusing my vast array of clothing I sniffed each garment individually to decide what had been worn for less than a week, there was always the turn things inside out option, but In the end I went for the, you’ve been wearing it all day you may as well keep it on option!! 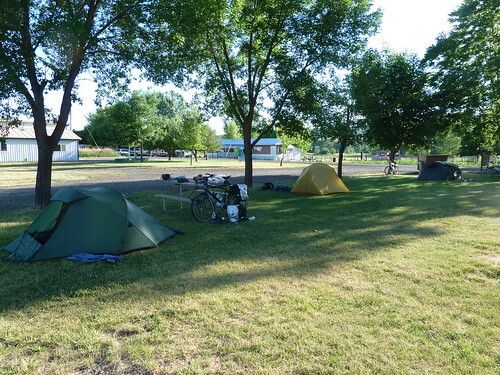 After dinner Fred and Barb turned up from their pitch on the other side of the site; the Dutch and Aussie sense of humour and the flowing beer made for a great night chatting and swapping tales from the road, we were to have plenty more nights like this in Idaho and Oregon. 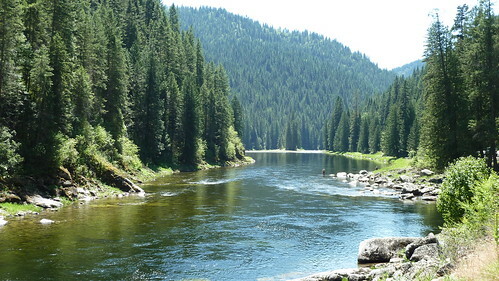 The Lochsa river was to flow to our left for the next 65 miles, running through steep pine clad mountain gorges, fed by creeks and waterfalls this beautiful snaking river would offer new jaw dropping vistas on every bend, to a point where it was almost easy to get blasé about them! I also came across this creek named after me!!! As there was no services what so ever on this section so a large breakfast was consumed and all three water bottles filled, the bonus was that our maps showed that from the top of Lolo pass it was pretty much down hill for 100 miles. 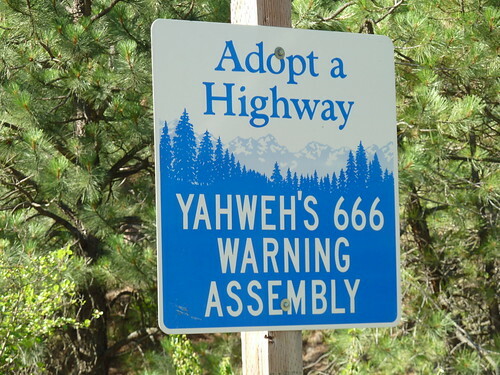 Now that's the type of route I like. 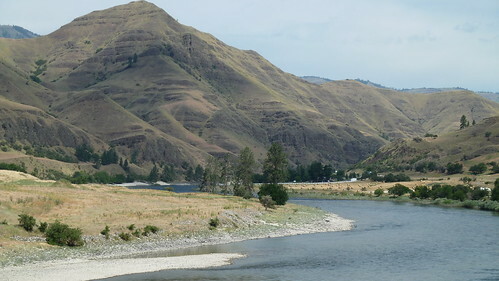 Turning west from the camp site at Lowell, the Lochsa became the Middle Fork Clearwater river and the route took us through the strangely “congenital disease like” named towns of Syringa, Kooskia and Stites! Coming out of Stites I came across an interesting phenomena; Stop \ Go Girlies! Coming up to a large section of road works in the UK you’d be greeted by a set of lights, or a burly tar splattered road worker with a stop go sign. 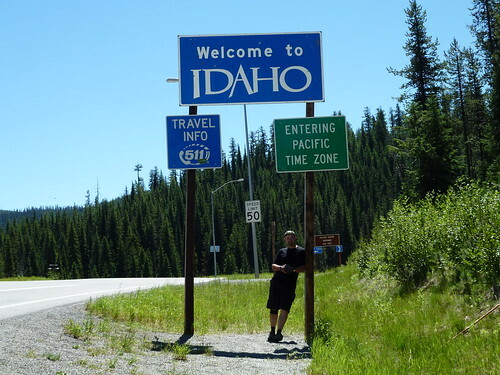 In this area of Idaho I was treated on a few occasions to attractive young ladies providing eye candy for the queuing male drivers \ cyclists. Having to wait 10 minutes for the lead car to come back, so I could follow it through, I had a nice chat with Stop Go girly about her experiences working the night shift on the Lolo pass, with nothing more than a light and a flask of coffee between her and a bear \ cougar laden wilderness, she certainly earned her dollars and provided an essential service! 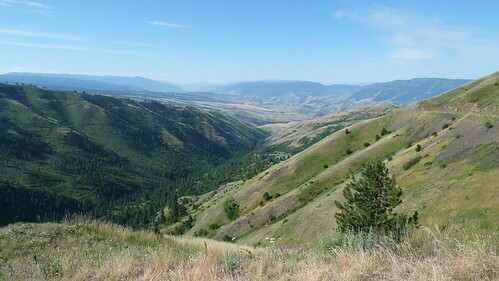 There was a big climb to come out of the Middle Fork Clearwater river valley and across to the Salmon River valley through the Nez Perce Indian Reservation. 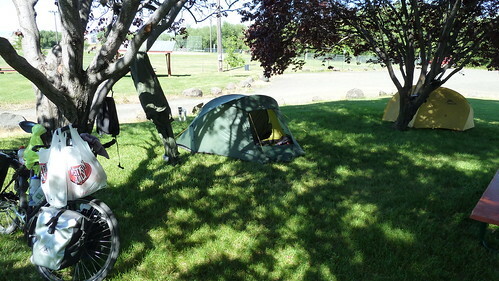 The Lions Club park at the town of Grangeville providing a nice free stop over for the night to recover and a big supermarket to reload with supplies. I was to see lots of reference to the Nez Perce tribe and pass various battle grounds and historical sites relating to them. 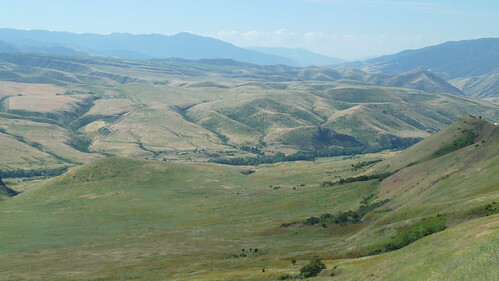 Their story is a sad one and worthy of a read http://en.wikipedia.org/wiki/Nez_Perce with their tribe fighting the last great battle between the U.S. government and an Indian nation in 1877. Leaving Grangeville I cycled with the Dutch guys up to the top of White Bird hill, the ride down passed the location of the first Nez Perce war. I stopped to look out from a view point on White Bird battle field, at the location where the US Calvary turned and fled and a small intense battle triggered a war. After White Bird we stayed on Highway 95 along the Salmon River, the road was busy in places and the scenery had changed to become more barren and rocky, but still very picturesque. We stopped at Riggins for the night, it claims to be the top US white water rafting destination. 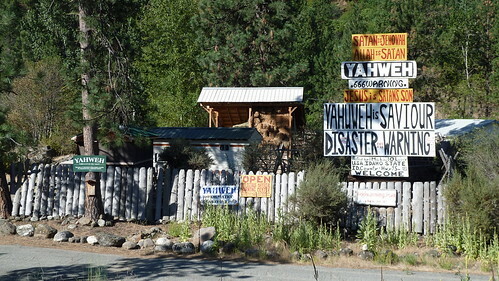 Whilst chatting with the camp site owner he informed us that four people had died rafting on the river that month, he shrugged, nonchalantly, “Just natural selection!”…. 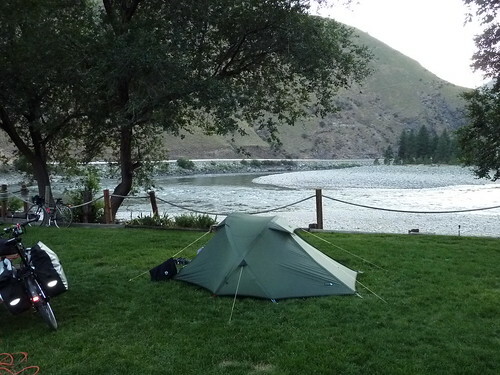 We stood by the tents watching rafters tackling the fast bend and rapids. Two rafts came down carrying groups of teenagers and to my surprise the kids all jumped out of the rafts into the rapids and were swept around the bend. But the unfortunate few got caught in a back eddy and simply went round in large circles getting more and more tired whilst the raft guides looked on helplessly, unable to cross over the river! After 10 minutes of this the camp site owner ran passed us, with a rope and buoy, muttering something about “bloody amateurs!” He quickly got the kids to safety. If this would have happened in the UK the Health and Safety Executive would have closed the river and shut down the rafting company, here it seemed like an everyday occurrence! 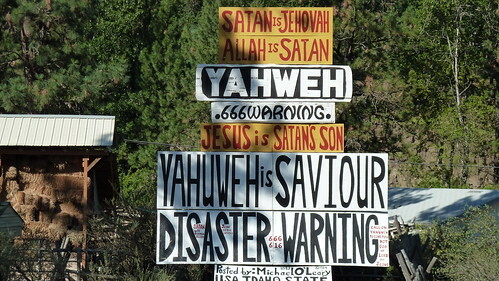 I have noticed in the USA that there are a lot of religious nutters and “The end is nigh!” type folks, some of whom seem to be hauled up in well fenced in locations with their opinions plastered on bill boards around the property. Just passed Pollock I came across one such place, but what amused me was the fact the local authorities had allowed this nutter to take part in the adopt a highway scheme and plaster his name on official road signs! 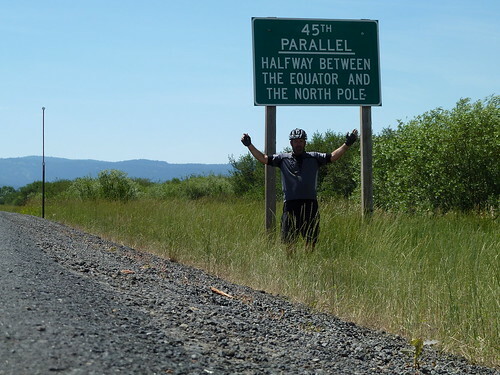 Just outside of New Meadows I crossed an invisible landmark, the 45th Parallel, half way between the equator and the North Pole. 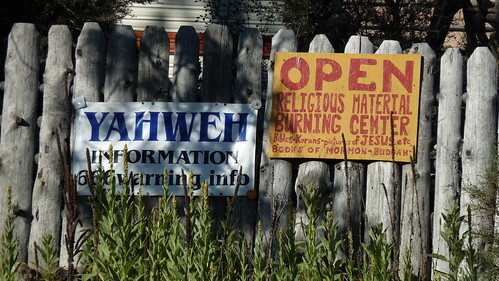 I wouldn’t have known if it wasn’t for the sign by the road! I got into New Meadows around lunch time and the first shop in town was an Italian coffee shop, having put up with endless cups of the foul black glass jug variety, that is topped up for free in most diners across the US, the chance of a latte bought me skidding to a halt. With wireless as well I new I’d be having a good hour off the bike. Well having just crossed such an important landmark I deserved a treat! The lady who owned the place and the motel next door was very friendly and we got chatting away, eventually the conversation moved onto the subject of the Trans Am. She wasn’t aware that the official route went passed her door and that she was the first place for west bounders to get a drink in over 30 miles. Dollar signs started to appear in her eyes and I advised her on making a big Route 76 sign, offering free water bottle fill ups, riders guest book and some sort of food deal for riders. She was really grateful and said she was going to get straight on it. 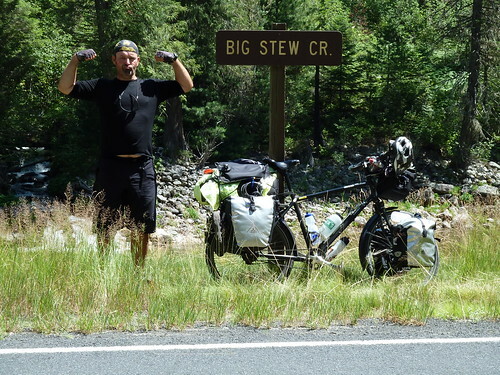 A few days later I was chatting with some of the ACA riders and asked Lee if they stopped in New Meadows. “Yeah, we all stopped in a nice coffee shop on the edge of town”, he told me “It had a route 76 sign and Trans Amers welcome”. I was really chuffed that my marketing advise had paid off and she was inundated with cyclists the next day, I think she owes me a latte! 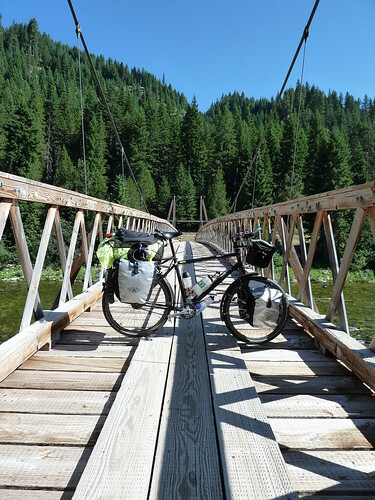 After a night in a nice RV park in Council IO we headed off on the formidable ride into Hells Canyon. 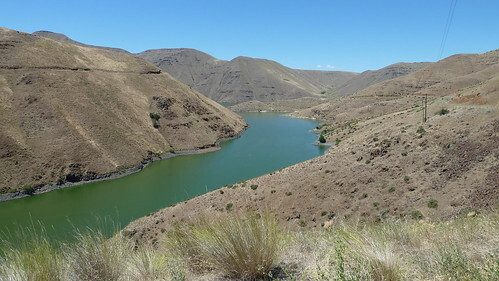 It is North America's deepest river gorge at 7,993 feet (2436 m). The long mornings climb to the edge of the canyon was followed by a crazy downhill to the reservoir in the hot windless canyon floor. Following its perimeter the reservoir leads up to Brownlee dam ands it’s large Hydro Electric plant. Crossing it’s out fall on the Snake river my journey through Idaho was over but my 10th and final state, Oregon was about to begin. Please note this Blog post has been written retrospectively, I have now finished the Trans Am, my end of journey post can be read here.